We hear a lot of instructions in yoga – “step your right foot forward,” “place your foot at a 45 degree angle,” “put your hand at 2 o’clock” and “place your hands 6 inches in front of you.” Are you confused yet? 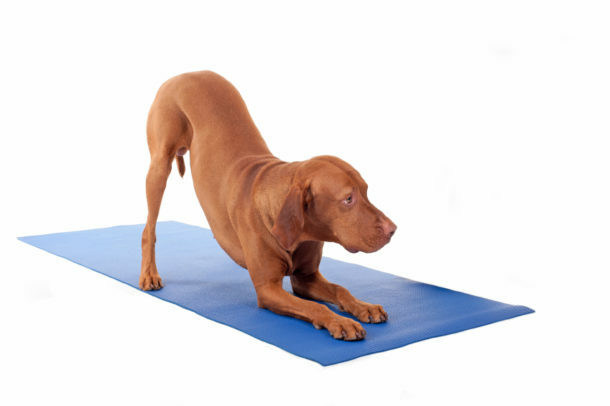 This good-humored blog by Maureen Convery reminds us that we do not need to be a mathlete to practice yoga. I took remedial Geometry in 10th grade. I’m not sure how they knew this was a terrible subject for me, but they did. Having just come from, and loved, algebra, I wasn’t very concerned about Geometry. Imagine my surprise when it just didn’t seem to take. Apparently I am missing the spacial awareness chip, so angles and visual distances are lost on me. I escaped the class with a C, which I’m guessing was a combination of the teacher feeling sorry for me and him not wanting me back in his class again. The only thing I ever learned about geometry is that I’m really bad at geometry! Fast forward 30 some odd years and I find that for the first time in my life, I actually need some of those skills! And guess where I need them? Not in my home improvements, not in my sewing, not in my landscaping, not in helping my kids with their homework, but in my Yoga Class! Who knew? When I first started Yoga, it was in a Repose class, which is a very gentle class designed for cancer survivors. There were no references to angles. I wonder if I would have continued, had my first class been full of directions including angles. I might have felt so dumb I wouldn’t have returned. Thank God that didn’t happen! Isn’t it bad enough that we have to remember our right from our left? Isn’t it bad enough that often a pose involves placing one part of our body to the right and the other to the left? And what about the whole clock thing; you know, “put your hand at 2:00”. Speaking of which, how do Millennial’s do Yoga with instructors who use clocks as a reference? For the Millennial, a clock is digital. The placement for 2:00 is to the left of the minutes! I guess I better not peek at a Millennial when I’m at a loss. And then there’s the whole space issue. When the teacher says “place your hands 6 inches in front of you”, what does that mean? What is 6 inches? And, if that is going to be a reference used in Yoga, shouldn’t there be a ruler on our mats? For that matter, why not create a mat that has both inches & feet marked at regular intervals, a clock to reference, and Left & Right written in each corner? I would invent such a thing but I have this issue with space and angles! All joking aside, I try to do my classes with my eyes closed. This is very helpful in terms of not comparing myself to others and staying in my own head. I often find though, when I open my eyes because I’ve been told 60 degrees and I don’t know what that means, that I’m in a completely different pose then everyone else! Which is another compelling reason to keep my eyes closed. The lesson here is if you find me looking at you in Yoga class, I’m not gawking, I’m just trying to figure out what the hell to do! Maureen Convery is the mother of three boys and resides in Lafayette Hill Pa. After surviving surgery and 4 months of chemotherapy for ovarian cancer, she has devoted herself to transforming her life. Maureen has a BA and MA in Psychology, worked in Human Resource management and helped open two restaurants. She currently focuses on yoga, meditation and the exploration of creative endeavors. She has made Yoga Home in Conshohocken her 'home’ to nourish her soul.